1. Brendan Elliot 2. Ken Sio 3. Dane Gagai 4. Peter Mata’utia 5. Nathan Ross 6. Brock Lamb 7. Trent Hodkinson (c) 8. Jack Stockwell 9. Danny Levi 10. Josh Starling 11. Sione Mata’utia 12. Jamie Buhrer 13. Mitch Barnett. 1. Brad Abbey 2. Brett Morris 3. Josh Morris 4. Brenko Lee 5. Marcelo Montoya 6. Josh Reynolds 7. Moses Mbye 8. Aiden Tolman 9. Michael Lichaa 10. James Graham (c) 11. Josh Jackson 12. Greg Eastwood 13. David Klemmer. Sitting lowly in the bottom five, the Newcastle Knights and Canterbury Bulldogs will be desperate to get a jump on the competition when they meet at McDonald Jones Stadium. Join The Roar from 6pm (AEST) for all the action! Two weeks ago these sides scored a whopping zero points between them. The Sea Eagles rocked their way to a 36-0 thrashing of the Dogs, while the Knights fell to the Panthers by an embarrassing 40 points. We’re always told to judge a team on how they respond, and if we’re going by that, then both teams can hold their heads high. The Bulldogs slogged out a hard-fought, three-point win against the Broncos, with two tries in five minutes to Josh Reynolds and Brad Abbey helping the side to a come-from-behind win. James Graham was enormous, racking up 56 tackles and almost 200 run metres, while monster forwards David Klemmer and Josh Jackson easily had their best games of the year to date. As for the Knights, they fell agonisingly short of a shock win over 2016 premiers Cronulla, a 78th-minute field goal from James Maloney breaking the Novocastrians’ hearts to seal a one-point win for the Sharks. There’s no doubt the efforts of the Newcastle side have improved since last year, and even with the injury list continuing to grow, the 17 taking the park each week are certainly heading in the right direction. Offseason recruit Jamie Buhrer seems to be slotting in beautifully and providing some much-needed direction and experience to the youngsters surrounding him. 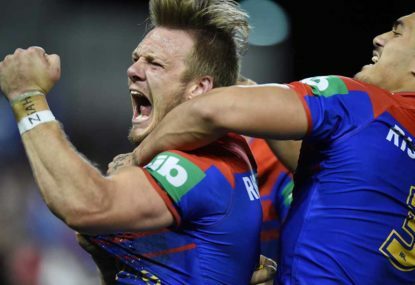 Hard-running winger Nathan Ross is back for the Knights, while the Dogs finally get back gun half Moses Mbye. Expect a game of a much higher quality than ladder positions may suggest. The Dogs’ pack found form last week, and despite improvements from the Newcastle side, Canterbury will roll on and be too strong. Join The Roar from 6pm for all the live action from this crucial clash in Newcastle!